If you are into fighting crime while looking super sleek doing it, NetEnt has crafted the perfect pokie. 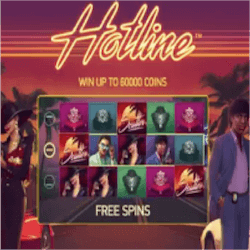 Hotline is a modern 5×3 reel pokie game with a funky 80’s retro look and feel, with bright colours, flashy cars and two polar opposite detectives trying to prevent a jewellery heist. It’s not just the graphics that are eye catching. This pokie’s over 97% RTP makes it stand out amongst other pokies. This game has been designed more with fun in mind as is testament from its relatively low minimum wager of 0.15 and its pretty low total jackpot of 60 000. This pokie is more for players who enjoy the journey more than the destination. What really helps push up the RTP in Hotline is how the bonus features manage to work together to make wins for you. NetEnt have really thought things out well here making for a very enjoyable game play experience. The sunset on the beach icon is the feature activating scatter symbol. Unfortunately there are only 7 free games to take, but an additional wild feature becomes activated. Regardless of where the Hotline is, whenever a wild symbol lands on your reels, during the 7 free spins, that wild will expand across the reels and trigger some wins potentially. These sunset scatters only appear on the 1ste, 3rd and 5th reels. Hotline’s Hotline feature lets you designate a special row on the reels as the triggering area for expanding wilds. With the Bonus Bet feature, you can double your staked wager and add another hotline to the reels. You can infact cover all three reels with 3x your staked wager. This feature starts off with 15 coins. If you bet 30 coins you get two hotlines, while if you wager 45 coins you can cover the entire reel with hotlines. Whenever the sports car wild symbol falls into a hotline section it expand across the reels. Additionally you can trigger a respin feature when this expansion happens, the expanded wild will become sticky and stay in place for the respin. Hotline is a hard hitting crime fighting pokie. If you are looking to foil a jewellery heist, while getting the girl in the process, this is definitely the spin for you. Its great retro look and feel makes for a really engaging experience.